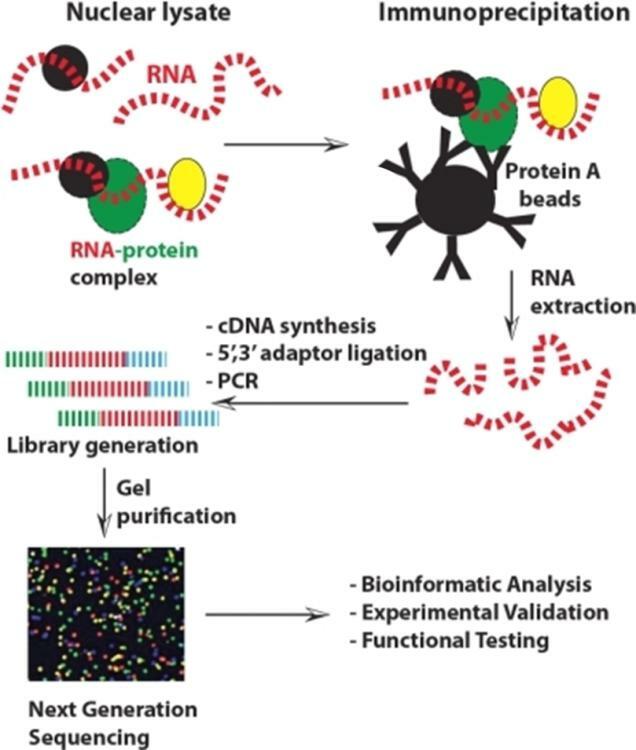 RNA immunoprecipitation (RIP) is similar to chromatin immunoprecipitation (ChIP), but instead of DNA, RIP targets RNA-protein interaction. RIP precipitates a specific RNA binding protein (RBP) and associated RNAs which can be analyzed by real-time PCR, microarrays or sequencing. In addition to immunoprecipitation method, researchers sometimes fuse a tag at either the C-terminal or N-terminal of the protein of interest, and the tag antibody thus can be used as IP antibody. This approach is economical because it allows the same tag antibody to be used for different protein detections and avoids generating different antibodies for individual protein target. Creative Diagnostics provide RIP service together with microarray (RIP-chip/rRIP-chip) and sequencing (RIP-seq) to identify RNAs that are bound by the RBP of interest. RIP-Chip is RIP method coupled to reverse transcription and a microarray. It can be used to identify subsets of RNAs that have related functions or potentially co-regulated, as well as proteins that are associated with them in RNP complexes. A noteworthy special application of RIP-chip is the recombinant RIP-chip (rRIP-chip). We use recombinant RBPs of interest to probe an isolated total RNA sample and immunoselect the messenger-ribonucleoproteins using a specific anti-RBP antibody. iRIP-seq is to sequence the pull-downed RNAs using high-throughput sequencing rather than analyzing them with a microarray. RIP-seq was recently developed to discover genome-wide RNA transcripts that interact with a protein or protein complex. RIP-seq is similar to both RNA-seq and ChIP-seq, but presents unique properties. We provide a full line of RIP-seq service to meet your research need. As a global biotech CRO, we provide service to clients all cross the continents. Please let us know about your specific RIP requirement and how we can facilitate your research and product development.